Scientists at the Department of Biochemistry, The University of Oxford, rely on a number of powerful imaging systems, several of which are supplied by Preston based Image Solutions (UK) Ltd. Their efforts are directed to understand how cells become polarised during embryonic development. Defects in this polarisation process are known to cause birth defects, and also are similar to the processes that go wrong in Alzheimer’s disease and Fragile X Syndrome. By studying neurons of the fruit fly Drosophila, they are trying to understand how RNA, a molecule related to DNA, moves and becomes localised during this process. Research Fellow with the Department of Biochemistry Prof. Davis and his team use three DeltaVision Core systems and an OMX 'super resolution' instrument to study how RNA behaves in real time, in living cells. The DeltaVision Core is designed as an imaging workhorse to image a large number of probes and samples with great precision. The OMX is a more specialised and advanced instrument that uses three dimentional structured illumination technology, developed by a team at the University of California San Francisco (UCSF): this doubles the spatial and axial resolution of a widefield light microscope. Additionally, this system can deliver high temporal resolution data for the study of fast dynamics in widefield mode. “Imaging is complex and scientists have many types of conflicting requirements, however here we are looking at very fast moving objects travelling at 1-2 microns/second, which requires wide field microscopy. Essentially DeltaVision Core is an excellent implementation of this sort of technology, based on an original design from its UCSF inventors, Profs Agard and Sedat,” said Prof Davis. One DeltaVision Core has been modified to work with an upright Olympus platform microscope, rather than the usual inverted microscope. Samples can therefore, be viewed from above. “This makes a big difference to us because we can image RNA as it moves in axons of motor neurons. We have also made modifications to allow micro-injections from the stage plate in order to carry out neurophysiological experiments,” said Prof Davis. The DeltaVision OMX, on the other hand, gives the Department the ability to image at speeds of up to 100 frames/second with excellent spatial resolution. “Professor Davis’s group was an early adopter of this technology - for which much of the empirical evaluation is presently still ongoing - and continues to work closely with the system manufacturer Applied Precision, the system inventor Professor John Sedat at UCSF and Image Solutions (UK) Ltd. to move this exciting but embryonic technology into the mainstream of biological imaging,” noted Mr Ian Corless MD of Image Solutions. 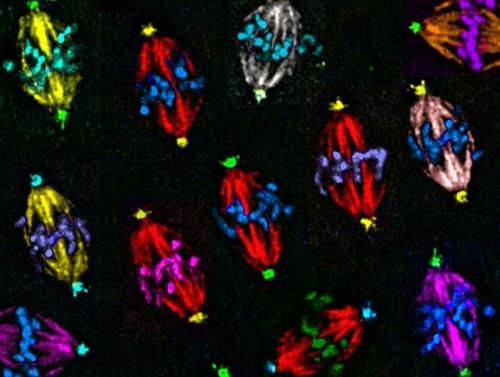 Image shows Chromosomes aligned at metaphase on a mitotic spindles in a Drosophila syncytial blastoderm embryo. The tips of the spindles are labelled with antibody against a centrosome component, the spindle is highlighted by an antibody against tubulin and the chromosomes are labelled with a DNA stain. The image was captured by G. Wilkie and I. Davis on a DeltaVision microscope using an Olympus 100x objective and the different colours are false colours created in photoshop.